Our customers filling wine vary in size from the small bottler attached to a vineyard ton the international corporation with many sites worldwide. As such our equipment range to match these requirements is considerable. 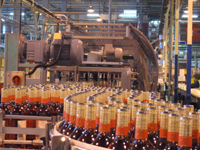 We can offer for instance a small filling line rated at 500 bottles per hour with manual packing and palletising. 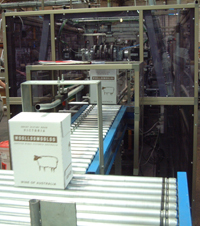 Alternatively we are able supply high speed fully automatic wine filling lines for 40,000 bottles per hour as required. A key elements in the this field are hygiene to prevent any contamination and air pick up in the wine which can cause the product to develop off flavours and reduce the shelf life of the product. For this we offer the baseless filler which is specially designed for hygiene not having a table top structure but being an enclosed filling room with a clear floor under the rinser/filler/capper carousels. To reduce the air pick up we use a combination of vacuum extraction of the air, nitrogen purging in the empty bottles, nitrogen injection into the caps, special multi stage vacuum extraction on the corker and nitrogen purging after the filling process. We can supply a complete wine filling line from the depalletiser to the palletiser and all equipment between such as labellers, capsulars, cartonners, check weighers, conveyors etc. 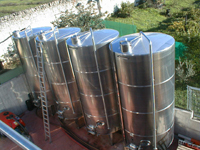 Large storage capacity of imported wines can be important so Enterprise Tondelli have a cost effective supplier of bulk wine tanks to give the bottler maximum flexibility. Single head capsular for tin capsules on 75 cl wine bottles. Rotary rinser with make up tank for bottle sterilisation. So whether you require a complete wine filling line or a single specific item, Enterprise Tondelli is on hand to help.